We came across the below error while scheduling the interview for H1B and H4 visa of USA. US travel docs resolved this issue in 24hrs and then we were able to schedule our appointment. Thanks for their timely support. I will provide the steps to resolve this issue as it will be helpful for all. 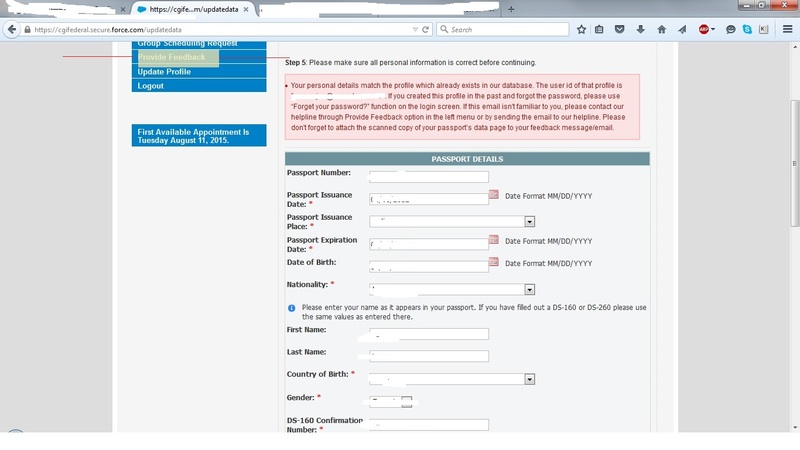 Root Cause :- USA travel docs is creating unique id for every person during the process of scheduling the appointment. I was worked for company AAA until 2015 and they have scheduled my appointment with respective relocation team email id in 2013. During that process my unique id was assigned to AAA company relocation team email id. When i was trying to schedule the appointment by own in 2015, i got the error that details you entered are already exists for a different email id(AAA company's team). So please use that email to schedule the appointment. Step 1:- As show in the image please Click on Provide feed back. Step 2:- Select the option "Online Errors". and then mention that your are no longer associated with AAA company email id and provide your email id to which your personal details to be attached. Step 3: Don't forget to attach the front and back of your passport as attachment. You will see the reply from support team with 48 hours. After that you need to login to the site with email id provided to them and then check your profile by click on "update profile". you will see your current passport details there. If any information mismatches other than name / DOB and passport no. You can correct it. All the best for your stamping and let me know if any questions while scheduling the appointment. i can help if i know that.